Enemies of innovation abound. While conformity is my current #1, it is not alone. And since I’ve already posted about the Top 4 Personal Enemies of Innovation, I realize the list will grow. The hierarchy is going to be irrelevant. Each enemy is a barrier to be overcome. My goal is to admit there’s a problem and provide some steps to overcome it. For this enemy of innovation, I view it as a particularly strong challenge for the enterprise intrapreneur. What is a successful corporation after all? It’s a large entity moving toward a common vision of success. The power of those multitudes of like-minded people is what creates such a powerful draw to conform. A lone voice of dissenting opinion is subject to ridicule, anger and hostility. Welcome to the the realm of the intrapreneur. The power of conformity is well documented. When you add in the professional pressures and the risk at stake for each person in a company thrown into the mix, it’s daunting. It’s important to know the enemy. I’m going to reach into the Psychology 101 arsenal to remind us all of studies that illustrate exactly what we face. 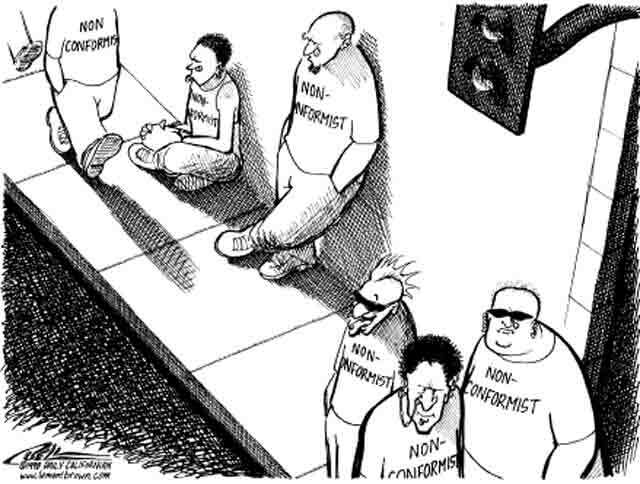 Conformity is adhering to the group norm, an agreed-upon standard of behavior. In 1937, Muzafer Sherif published findings that showed the norms are established through interaction of individuals and those interactions level off extreme opinions. The result is a consensus agreement that tends to be a compromise, but more interesting is that the norm is held even if it is wrong. 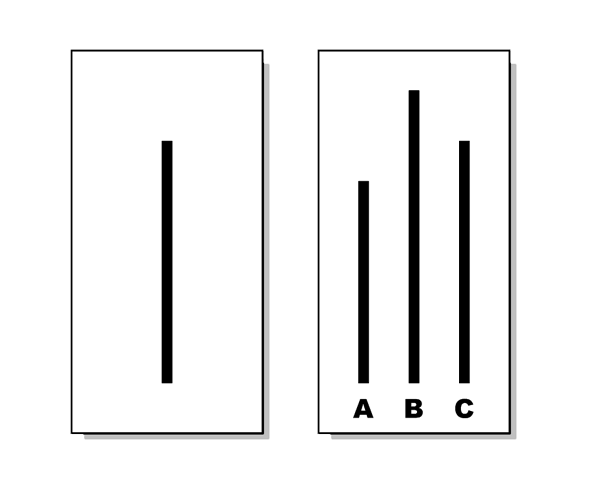 Solomon Asch, in 1951, took the study further asking participants to match items most similar, and when the majority chose the wrong answer (they were part of the test) others would willingly follow along. They did so for fear of being ridiculed. A few really did believe the group’s answers were correct. They believe the group is better informed than they are (informational influence). We change our behavior to match the response of others. Chartrand and Baugh call this The Chameleon Effect. It’s the unconscious mimicry of the postures, mannerisms, facial expressions and other behaviors of those in our social environment. And these tests were all run with strangers…what if they were member’s of your own circle of friends or colleagues? Just because you know pressure to conform exists doesn’t make it easy to solve. So how do you break the cycle of conformity? A textbook example can be seen in the movie “12 Angry Men.” Henry Fonda plays Juror 8 – a masterful negotiator. He builds alliances, uses brainstorming, offers concessions, anticipates offers, re-frames and masters factual information. By doing so, he shows how one person can manage to shift the dominant opinion to his own. The movie illustrates not only how to resist and break through conformity, but shows what will be experienced during the process – and it isn’t pleasant. As an outlier, we face ridicule, anger and hostility. As the studies above show, the thought of potential ridicule is enough to change behavior. As an innovator and intrapreneur, we are purposefully stepping into an environment that invites this behavior. The first step to break conformity is to get someone on our side. If the intrapreneur can get a few people to defect to their side, then this will often shift the dynamic so that others will change their opinion. It loosens the pressure to conform by placing doubt around the unanimity of the situation. In the Milgram studies, people were less likely to obey if other people in the study disobeyed. Defections give others the strength to go against the majority. This is why executive sponsors help intrapreneurs so much. It is an immediate benefit to shifting corporate conformity. If you don’t have that sponsorship, you will have to earn it by selling the vision and getting traction for the new idea. 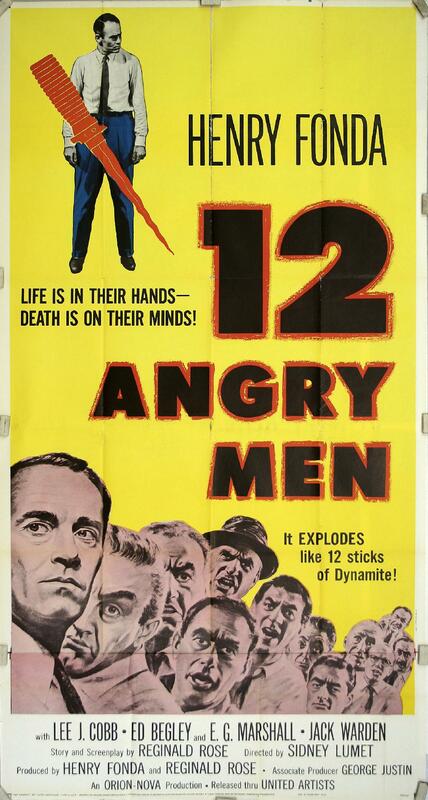 In 12 Angry Mean, Hendry Fonda always remains consistent in his opposition to the majority. He never wavers, but stands firm in his conviction making the other jurors think more deeply about the issue. Other people probably make the attribution—as Joseph Sweeney did (the old man) that if a person is willing to stand up against the entire group and face ridicule, then he must have some important points to make. So this kind of consistency against the majority can lead others to augment their opinion of the minority’s beliefs. While the minority has to be consistent, they also have to avoid appearing rigid and inflexible to the majority. Consistent, but open minded, doesn’t put the majority on the defensive, and keeps them more open to the minority. Fonda clearly did this by saying that he didn’t necessarily think that the majority was wrong, but just that he wanted to talk more about the case and discuss some of the issues. Likewise, the intrapreneur is consistent in the change or new product that is needed, but not in his method for delivering it. The willingness to test and pivot an idea to reach the goal provides a range of opportunity to accept input from others and yet maintaining the resolution needed to build a new business. Juror 8 was clearly self-confident. He had complete conviction in what he was doing and saying which instilled confidence in other members of the jury who were becoming less entrenched with the majority opinion. The same skill is critical of the intrapreneur or entrepreneur to maintain the confidence to sell a vision that few others see. It’s not one of the criteria to break conformity, but it is one required to build a business. Throughout 12 Angry Men, Juror 8 demonstrates he is certain and committed to his position, and that the majority should shift to his position. He exhibits five key aspects to help a minority shift opinion from the majority – consistency, investment, autonomy, rigidity, and fairness. What have you found essential to breaking from conformity?